Tourist information and guide to places to visit and see in Palma de Mallorca, Majorca, Spain. Palma de Mallorca is located about 23 km. from Santa Ponsa. A daily visit to Palma and discover the beautiful scenery of the capital city is also one of the best sightseeing options and excursions from Santa Ponsa. In Palma, there are many great places to visit and see. 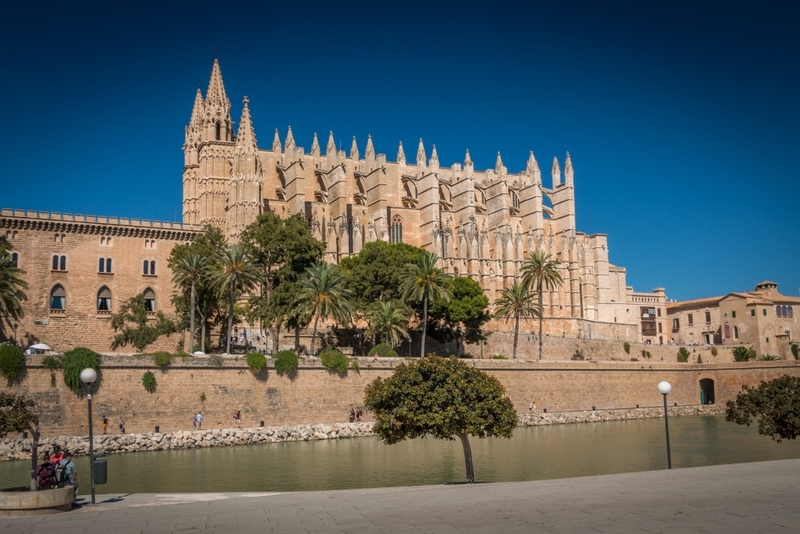 Popular sights in Palma include; Bellver Castle, sa Llotja (old commercial exchange), the La Almudaina Royal Palace (the old Citadel) and the La Seu Cathedral. The whole route should be done on foot. Hardly any distance at all separates the Cathedral from the Almudaina, the Mallorcan Museum and the Moorish Baths. The La Seu Cathedral is a gothic style cathedral and one of the best sights and landmarks in Palma. There is also a fine Baroque cloister and an interesting Cathedral Museum in the La Seu Cathedral, displaying excellent Gothic paintings and sculptures. Opposite the Cathedral, just across the Plaza de l’Almoina, is the Almudaina. Nowadays the H.Q. for the Balearics Military High Command, it began life as an alcázar (fortress/residence) of the Moorish Walis’ Caliphate (11th-13th centuries) before being converted into a palace by James II (14th century). The Church of St. Eulalia, located in the square at the rear of the City Hall, was the first Christian church built in Palma and is a good instance of Catalonian Gothic. Sant Francesc, Santa Clara, El Socorro, Sant Miquel and Monti–Sion (on the site of an old synagogue) are further churches of note in the Old Quarter. Other popular sights at the newer parts of the city include the modernist buildings on the Plaza Weyler, particularly the Gran Hotel, now restored and refurbished as the head office of the La Caixa Foundation (a Catalonian savings bank) and, in its time, the first hotel ever built in Palma. It’s an easy walk from the City Hall, via the Plaza Mayor (Main Square). Bellver Castle is also another great sight that it was constructed in the 13th century at the time of James II and, though never used as a defensive stronghold, served as a prison in different periods. It is the only building which is not within easy walking distance of the city centre. The Castle overlooks the El Terreno Quarter and the Palma Bay. Holidaymakers may visit and discover Palma by themselves via car hire or buses. Also another great option is the Palma City Sightseeing Bus. Visitors are able to hop off at any of the stops along the route and hop back with a 24 hour valid ticket with the City Sightseeing Bus.